Our unit was formed in mid 1996. We are based at the Howick Historical village in Auckland (Bell's Road, Pakuranga), a recreation of a Fencible settlement of 1850 - 1880. We do a drill display, firing demonstration (we also have a 1/3 scale brass muzzle-loading cannon), skirmish drill and living history encampments. We have also taken part in the celebrations at Onehunga, held on Labour weekend, 26 October, 1997, marking the 150th anniversary of its founding as a Fencible settlement. To mark the occasion, we marched from the site of the the Albert Barracks, now the University of Auckland, a distance of about 13 km, re-enacting the route marches the soldiers used to do when they embarked on ships from Onehunga. On 22 November, 1997, to mark the anniversary of the Battle of Rangiriri (20-21 Nov, 1863), we visited the Alexandra Redoubt, Tuakau, and the battle site at Rangiriri, to pay our respects to those who fell. 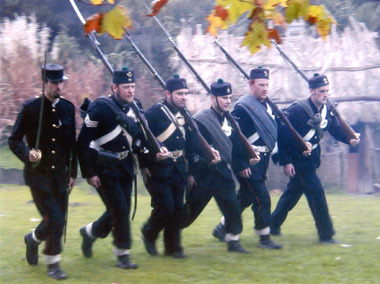 From February, till June 1998, we were extras in a New Zealand made historical drama, called "Greenstone". It is set in the early 1840s and we play the part of Lord Halford's Militia. We wear a curious 'fantasy' mixture of cavalry uniform with infantry equipment (Enfield equipment at that) as shown in the photos of us. On 18 May, 1998, we took part in the Charter Parade of 3 (Auck) North - celebrating the centenary of this New Zealand Territorial Army unit. We represented the 'original' defenders of Auckland. On 24 May, 1998, the town of Te Aroha celebrated the centenary of the opening of the Cadman (thermal) Bathhouse. We stood in for the Volunteer Rifles in the re-enactment of the opening, receiving a boxing championship belt and firing a feu de joie, as was done on the day. In December, 1998 a photograph of us appeared in "New Zealand Defence Quarterly". In March, 1999, for something different, some of our members joined the Confederate Army and attended a "Wild West Weekend" in Carterton. Click here to see a report of our adventures. In January 2001, to comemorate the 100th anniversary of Queen Victoria's death, we took part in the Queen Victoria Day picnic in Albert Park (site of the Albert Barracks), Auckland. In February 2001, we took part in the Taranaki Searchlight Tattoo in New Plymouth. We mounted guard in front of "Edinburgh Castle", dressed as 65th Regt. soldiers in red coat and sailors from HMS Niger (both of whom fought in the battle of Waireka). We fired a feu de joie with rifle and mortar to open the show. In November, 2001, we helped the University of Auckland anthropology department in an archeological dig of part of the Albert barracks site, by identifying dug items and showing them our reproduction equipment. Here is the account in a local newspaper. On 20th November 2003, we took part in the commemoration of the Battle of Rangiriri. We appeared on the TV news, firing a salute and giving a short interview. In February 2004, we returned to the Taranaki Searchlight Tattoo in New Plymouth, where we repeated our performance of three years' earlier. We are often in demand for our expertise in mid 19th century military subjects and offer an equipment hire, historical and costume advisory service, and supply of extras to film/TV and theatrical groups. "Length of a Memory" - short movie. "Manu Rau - 100 Birds" - Play about G F Von Tempsky's military career in New Zealand. "Nga Tohu/Signatures" - first of three videos made by the Legal Services Board about Treaty of Waitangi issues. "Life and Times of Te Tutu" - "War" episode of TV comedy series starring Pio Terei and actor/director Ian Mune. 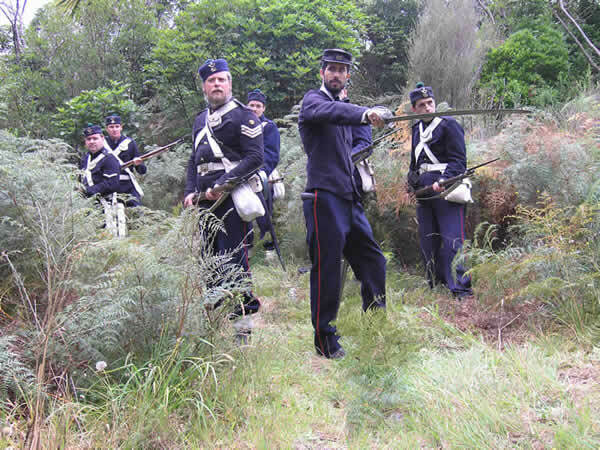 "Epitaph" TV series - episodes set in the Crimean War, Taranaki, and the battle of Gate Pa.
"Mataku" TV series - "The blue line" episode - dressed as 1872 Armed Constabulary. "Ghost of Von Tempsky" - TV documentary about the life of famous officer in the Forest Rangers and Armed Constabulary. "River Queen" (IMDb listing), a feature film starring Kiefer Sutherland, Temuera Morrison, Samantha Morton and Cliff Curtis. I was the military advisor on the film. The movie is a love story, set in the late 1860s during the wars between Colonial forces and Maori (a fictional parallel to the Te Tokowaru's war). Premiered at the Toronto Film Festival, 12 September, 2005, general release in New Zealand on 26 January 2006. In early March 2008, we filmed a short battle scene for "the Ride film" to be shown at the Museum of New Zealand Te Papa Tongarewa, from August 2008.